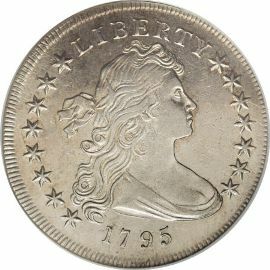 The Draped Bust Silver Dollar with Small Eagle reverse was minted between 1795 and 1798. These coins are very important with regard to history as they carry the same obverse as the famed 1804 Silver Dollars! monetary system. 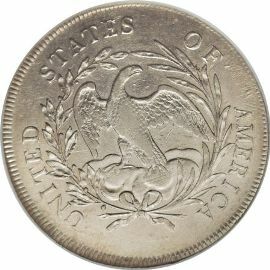 The United States wanted to incorporate beauty as well as accuracy of metal content in all products from the mint. The obverse of these silver coins, like all other coins of this series, features Gilbert Stuart's portrait of Mrs. William Bingham. The portrait was surrounded by from 13 to 16 six-pointed stars. The obverse also has LIBERTY inscribed above and the date below the portrait. STATES OF AMERICA around the wreath.